Howard, Janet L. 2002. Tetradymia nuttallii. In: Fire Effects Information System, [Online]. U.S. Department of Agriculture, Forest Service, Rocky Mountain Research Station, Fire Sciences Laboratory (Producer). Available: https://www.fs.fed.us/database/feis/plants/shrub/tetnut/all.html . The scientific name of Nuttall's horsebrush is Tetradymia nuttallii Torr. & Gray (Asteraceae) [7,9,18,43,44]. Nuttall's horsebrush occurs in south-central Wyoming and western Colorado across Utah to Elko County, Nevada [7,18,43,44]. Nuttall's horsebrush occurs in shadscale (Atriplex confertifolia), black greasewood (Sarcobatus vermiculatus), sagebrush (Artemisia spp. ), and pinyon-juniper (Pinus-Juniperus spp.) communities [9,44]. It does not occur in pure stands and is not a plant community dominant. It usually found as isolated individuals or in small colonies . Nuttall's horsebrush is a native subshrub or shrub with semiwoody to woody stem texture . Mature plants are 1 to 4 feet (0.3-1.2 m) tall. Stems are stiff and much branched [7,18,23]. Horsebrushes (Tetradymia spp.) have 2 types of leaves: primary and secondary. Primary leaves of Nuttall's horsebrush occur on elongated stems and are subtended with 0.4- to 0.8-inch (1-2 cm) spines. Secondary leaves occur in the axils of primary leaves and have smaller spines. The flower is a corymb with tubular, perfect flowers. The fruit is a 3- to 5-mm hairy achene with a bristly pappus [7,22,23,44]. Horsebrushes are tap-rooted . Nuttall's horsebrush regenerates from seed and by sprouting [3,4,26,37,40,42,45]. Information on breeding, seed production and viability, and seed banking is scant for Nuttall's and other horsebrushes. Further research is needed on the reproductive ecology of this genus. Seed dispersal: Horsebrush seeds are wind dispersed . The hairs on horsebrush achenes and pappi aid dispersal . Seedling establishment/growth: Seedling establishment is rare in horsebrushes, probably due to harsh environments . Asexual regeneration: Nuttall's horsebrush sprouts from the root crown after top-kill [3,26,37,45]. As of this writing (2002), information on Nuttall's horsebrush's successional role is lacking in the literature. As a sprouting species, it is likely that Nuttall's horsebrush is seral. Other sprouting horsebrushes are commonly found in seral plant communities . Nuttall's horsebrush flowers from late May to early June [7,22]. The leaves are drought deciduous, with the secondary leaves shed 1st. Colonies usually have synchronous flowering. Failure to flower or develop seed is apparently triggered by low rainfall. In very dry years, some individuals -- or entire colonies -- may not flower, or will flower and not set seed . Fire adaptations: Horsebrushes are "slightly damaged by fire" : top-growth is removed. Nuttall's horsebrush sprouts from the root crown and unscorched aerial stems after fire [4,40,42]. Fire regimes: Fires in the desert shrub and grassland ecosystems in which gray horsebrush occurs were historically stand replacing. Fires in pinyon-juniper types were of mixed severity . The following table provides some fire return intervals for plant communities in which Nuttall's horsebrush occurs. Find further fire regime information for the plant communities in which this species may occur by entering the species name in the FEIS home page under "Find Fire Regimes". Fire top-kills Nuttall's horsebrush [4,40,42]. Fire seldom kills horsebrush species [28,29]. Nuttall's horsebrush sprouts from undamaged stems and from the root crown after fire [4,40,42]. Fire exclusion on desert steppes has tended to favor sagebrush species over fire-tolerant shrubs such as horsebrush [6,15,17]. Increased fire frequencies due to invasion of cheatgrass (Bromus tectorum), red brome (B. madritensis ssp. 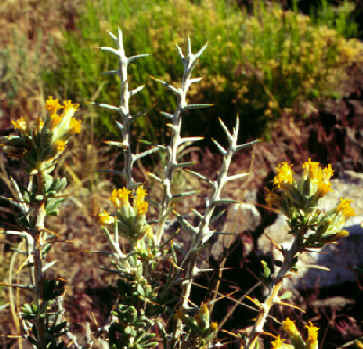 rubens), and other annual grasses may favor Nuttall's horsebrush over sagebrushes. Palatability/nutritional value: Horsebrushes are unpalatable except early in the spring, when browsers may consume young shoots and buds . Nuttall's horsebrush is not a toxic horsebrush species, but livestock and wildlife seldom consume it [12,33,36,38]. In Utah its palatability is rated poor for livestock, large game animals, upland game birds, waterfowl, and small nongame birds, and fair for small mammals . Cover value: Cover value of Nuttall's horsebrush is rated poor for pronghorn, elk, mule deer, and waterfowl, and fair for small mammals, upland game birds, and small nongame birds of Utah . Horsebrushes provide critically needed ground cover and erosion protection on dry sites that are otherwise often sparsely vegetated .